The Tri-City area of Fremont is rich in local history that is a part of the larger history of California. This land was populated by prehistoric animals, settled by Native Americans (Ohlone), claimed by the Spanish, ruled by Mexico,then became a part of the United States. We saw new immigrants build towns, changes in agriculture, the expansion of transportation and industry, population increases and demographic changes. We encourage all ages to learn about this unique and exciting history. We are one of nine local history organizations that came together to create the Passport to Adventure Program. To begin visit any one of the nine sites to pick up your passport postcard and have it punched at each location. 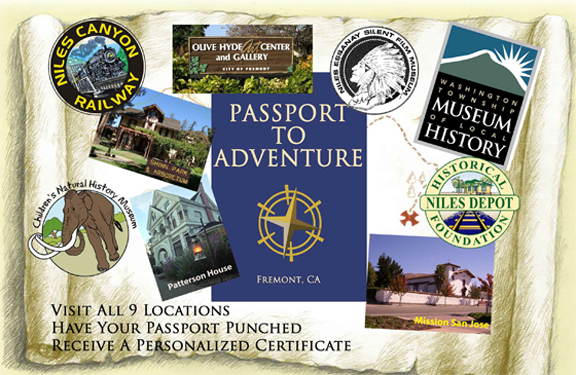 After you have visited all nine historic sites you will receive a personalized certificate of completion and will become a “Passport to Adventure Historian”. Passport postcards are available at all of the participating locations below or can be downloaded here. Let the adventures begin!